DEAR JERRY: Since I rate “Whole Lot of Shakin' Going On,” by Jerry Lee Lewis, as one of the greatest Rock hits ever, I started digging into its history. Until Jerry Lee's version, I never heard the song by anyone, and assumed it was brand new. I even figured he wrote it, as he did many of his recordings. Apparently it came out originally by a fellow named Roy Hall. I heard a brief sample of his record and it doesn't sound much like the song we know by Lewis, but does have the same title. Are there any other recordings of this classic that precede Jerry Lee's? DEAR LUCY: I know of four, one of which is the Roy Hall rendition, though his is not the first issue. The Jerry Lee Lewis release (Sun 267) shows the title as “Whole Lot Of Shakin' Going On.” That change is only slight, but Jerry Lee's arrangement and lyrics are drastically different than the earlier records. 1. September: Big Maybelle (Okeh 7060). Actually recorded March 21, 1955, this is the first waxing of “Whole Lotta Shakin' Goin' On.” It is pure blues and should have been an R&B hit. Arranged by a newcomer, 23-year-old Quincy Jones. 2. October: Roy Hall (Decca 29697). Hall's version is a country bopper. 3. November: Dolores Fredericks (Decca 29716). Dolores is similar to Georgia “Dance with Me Henry” Gibbs, but the accompaniment by Jack Pleis and His Orchestra, gives this an unexpected big band flavor. 4. December: Commodores (Dot 15439). Think of this as the Mills Brothers dabbling in doo-wop. Not only did none of these four become a hit in any field of music, none even received a new-release review in the trades. Contrary to Demain's announcement, we know of no Quincy Jones solo recordings for Okeh. The evolution of the song remained on hold for nearly 18 months, when in the summer of '57, Jerry Lee resurrected it. By July, “Whole Lot of Shakin' Going On” was the ultimate crossover hit, at or near the top of every one of the major charts: Pop; Rock; R&B; and C&W. Since then, dozens of top stars have recorded “Whole Lot of Shakin' Going On,” much to the joy of co-writers Dave Williams and Sonny David (though some labels credit only Williams). I believe the name of singer to be something like Curtis Leeach. —John W. Parsons, Evansville, Ind. DEAR JOHN: Other than one vowel too many, you have all the details. The singer is Curtis Leach. Though clearly a truck driving song, the highway man in “Highway Man” is not the truck driver. He is a highway patrolman, who first saves the driver's life … then cites him for speeding. Issued in 1964, “Highway Man” is an enjoyable adventure story, written by Leach, with instrumentation influenced by “Six Days on the Road” (Dave Dudley). IZ ZAT SO? On December 14, 1965, in a mysterious confrontation, perhaps involving an intruder, Curtis Leach was stabbed in his left leg. Unfortunately, the blade cut the femoral (primary) artery and Curtis bled to death en route to the hospital. 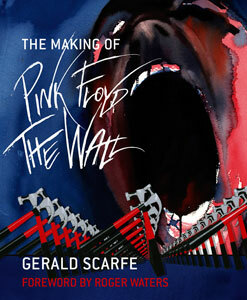 Working with the Marketing Manager at Da Capo press www.dacapopressmusic.com, I am happy to announce that I will give away three copies of the new book 'The Making of Pink Floyd: The Wall,' by Gerald Scarfe. A marvelous behind-the-scene look at the legendary rock band's evolution into rock and roll history. Twenty years after the inaugural live show of The Wall, Roger Waters is back on the road as part of a worldwide tour of the celebrated album—more than forty venues sold out in under two hours. In conjunction with Waters’ tour, Da Capo Press will publish The Making of Pink Floyd: The Wall (Da Capo Press; September 15, 2010). In this striking new book, visionary Gerald Scarfe brings fans a never-before-seen look at the legendary band and the making of The Wall in all its forms—the iconic album, the larger-than-life stage show, the cult classic film, and the re-invented 2010 tour. As the designer, director of animation, and driving creative force for Wish You Were Here and The Wall’s first stage show and film, Scarfe gives an intimate look at the band’s high and low points both on and off the stage. Starting with his introduction to Pink Floyd in 1973, Scarfe chronicles his personal experiences with the band, the conceptualization of The Wall album, the development of the live show and film, and a behind-the-scenes look at the revitalization for the 2010 tour. Providing an insider’s look at the evolution of one of the most talked-about and well-loved rock albums, the book is full of storyboards, sketches, and photos—many of which have never been published. Fully authorized by Roger Waters and Pink Floyd, The Making of Pink Floyd: The Wall features exclusive interviews with Roger Waters, David Gilmour, Nick Mason, The Wall actor Bob Geldolf, and director Alan Parker, along with complete lyrics. Few other rock albums have enjoyed the longevity and incarnations as The Wall. The Making of Pink Floyd: The Wall offers Floyd fans, art enthusiasts, film buffs, and the casual music lover a window into the world of one of the most renowned music experiences of all time. Gerald Scarfe has been the political cartoonist for the London Sunday Times for 42 years and has worked for The New Yorker magazine for nearly two decades. For many years he was involved with Pink Floyd in providing animated footage for all of their stage performances as well as jacket artwork for record covers and CDs. For The Wall he worked with Roger Waters on the original visual concepts for the album and the stage shows and was initially co-director and subsequently designer and director of the animation for the film. He has again worked with Roger Waters on the new stage show of The Wall now on tour in North America. Australia’s ‘King of rock’n’roll’ Johnny O’Keefe, the first Australian rock’n’roll performer to tour the United States, and Australia’s most successful chart performer, with 29 Top 40 hits between 1958 and 1974, died of a heart attack in 1978 (age 43). O’Keefe’s 1958 hit, "Real Wild Child," was covered by Iggy Pop in 1986. The Beatles make their first personal appearance in 1962. They signed copies of "Love Me Do" at a record store in Widnes. The Yardbirds appeared at Studio 51, Leicester Square, London in 1963. In 1964, the Beatles spent the afternoon recording "Eight Days A Week" at Abbey Road studios in London. Late evening was spent at The Ad Lib Club, London, partying with The Ronettes and Mick Jagger. In 1965, Gary Lewsi & the Playboys recorded the cuts "She's Just My Style" and Sure Gonna Miss Her." The Jimi Hendrix Experience recorded a session for the UK BBC radio show 'Top Gear' in 1967. Stevie Wonder, who was also appearing on the show, jammed with Hendrix. The Doors appeared at the Cal State Gymnasium, Los Angeles, California in 1967. With The Nitty Gritty Dirt Band and The Sunshine Company. 'The Doors are Open' was aired on British TV in 1968. The show was a documentary, appropiately about the Doors. In 1969, for the first time in Beatles history, a George Harrison song got the A side of a 45 rpm record, "Something"/"Come Together." The US Top 5 singles in 1970 were: at #5, "All Right Now" by Free, at #4, "Ain't No Mountain High Enough" by Diana Ross, at #3, "Candida," by Dawn, at #2, "I'll Be There, by the Jackson Five and at #1, "Cracklin' Rose," by Neil Diamond. Cher started a two week run at #1 on the US singles chart in 1973 with "Half-Breed." It was her second US #1 hit. Amazingly, the inane cut "Disco Duck," by Rick Dees and His Cast of Idiots, received a gold record in 1976. The song became only the fourth single to be certified platinum in December of 1976. Robert John went to #1 on the US singles chart in 1979 with "Sad Eyes." "Heartache Tonight," by the Eagles, was released in 1979. Fleetwood Mac's "Tusk" was released in 1979. In 1980, the Bee Gees sued their record company Polygram and the band's manager Robert Stigwood for fraud for 200 million (case settled out of court). Barry Manilow plays a concert for charity at the Royal Albert Hall in London in 1983. The show was attended by Prince Charles and Princess Diana. Maxi Priest went to #1 on the US singles chart in 1990 with "Close To You." In 1991, Michael Jackson gave away the bride at Elizabeth Taylor's seventh wedding, held at Jackson's Neverland Ranch. The Groom was construction worker Larry Fortensky, whom Taylor would divorce in 1997. Country singer Tim McGraw married Faith Hill in 1996. TAKE THAT! In 2004, Britney Spears threw a full cup of cola over a photographer. The snapper was waiting to take pictures of the singer and her new husband outside a subway take-away shop in Malibu, California. Also in 2004, Incubus singer Brandon Boyd was arrested for carrying a switchblade in his bag while trying to board a plane at New York’s LaGuardia Airport on his way to a concert in Raleigh. Charged with criminal possession of a weapon, Boyd was able to make the concert. He says he forgot the knife was in the bag. DUH! you're going through airport security! In 2006, an audio tape Bob Dylan recorded in 1959 with a high-school friend in his hometown of Hibbing, MN, went up for auction. The cassette featured Dylan singing three tunes. In 2007, Bruce Springsteen was being sued for $850,000 by a man who claimed he backed out of a contract to buy a horse. Springsteen and his wife Patti Scialfa were both named in legal documents filed in Florida by Todd Minikus. He claimed the couple pulled out of a deal to pay $650,000 for a horse, named Pavarotti. Queen's groundbreaking promo for their 1975 hit Bohemian Rhapsody was named the UK's best music video in 2007 in a survey of music fans. Out of 1,051 adults polled by O2, 30% named the six-minute video, (which took only three hours to shoot and cost a mere $5,000 to make), their favorite. John Kay & Steppenwolf played the Dreamcatcher rally in Aberdeen, MD in 2007. The show closed out the group's 40th Anniversary Farewell Tour. Pink Floyd's David Gilmour received the Outstanding Contribution to Music trophy at the Q Awards 2008 in London. The guitarist payed tribute to the recently deceased Floyd keyboardist Richard Wright. "He deserves this just as much as I do," says Gilmour. "His work was vitally important to (Floyd's) entire career." KISS issued “Sonic Boom” in 2009. The album was part of a three-disc set that was sold exclusively at Wal-Mart and Sam's Club stores – and their online outlets. The collection contains “KISS Klassics,” 15 re-recorded hits and a DVD with footage of an ’09 concert in Buenos Aires. As part of their Halloween promotion Wal-Mart stores offer special KISS merchandise - T-shirts, wigs, makeup, limited edition M&M's and even versions of Mr. Potato Head. And that evening, the group was on The Late Show with David Letterman. "Our next guests are here to blow the roof off the dump, ladies and gentlemen," says Letterman. The "dump" would be the Ed Sullivan Theater. Amazing, didn't they do this in the 70's?